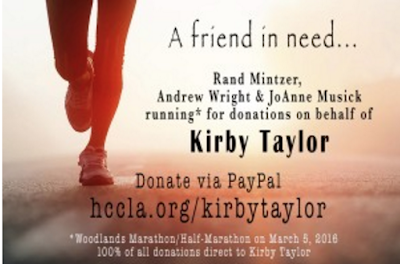 As most of the CJC Community knows, Kirby Taylor, a friend and defense attorney, was the victim of a brutal attack that badly injured him, and killed his son. 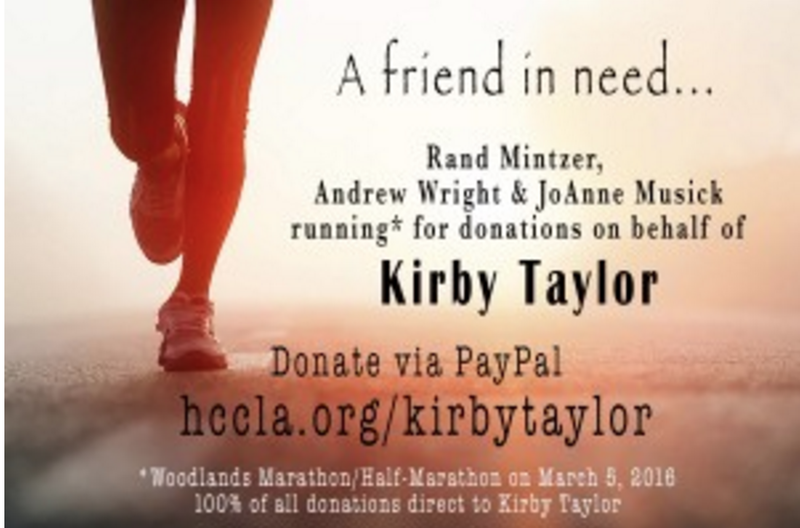 HCCLA's Rand Mintzer, Andrew Wright and JoAnne Musick are running in the Woodlands Marathon on March 5th to raise money to help Kirby with his medical bills. You can help by donating by going to this website and donating through Paypal. I've known Kirby since I've been a lawyer. He is one of the kindest souls down at the courthouse. He has a great sense of humor and an infectious laugh. The idea of someone want to cause him harm defies reason. All of our thoughts and prayers are with him during this tragic time in his life.